'Future Proofing' learners to succeed in a world we don't know yet. Dubai, UAE, April 03, 2019: No one can know for sure what the future holds for the human race; job automation, robots or a universal basic income. What we do know, however, is what our future learning spaces will look like, and that it is our responsibility as humans to future-proof our young ones, the workforce of tomorrow. An evolving workplace means upskilling team members and developing new 21st century competencies. Companies are changing. Many are increasingly providing stimulating environments which are intentionally designed to foster co-creation and collaboration. Various organisations are also integrating subject matter experts across disciplines who can work outside of their comfort zones from the onset of a project or develop products maximising synergies, leading to greater innovation. These changes at the industry level require transformations in education. We must consider how education prepares the talent pool, creating the future leaders of these companies and the team members who will be exposed to a dynamic culture of collaboration and converging disciplines. 'Future proofing', or preparation for a world we are yet to understand, begins with engaging learners in big transferable ideas that transcend time, geographical limitations and varied situations. In order to nurture and create human capital for sustainable development, we must instil ideas such as a growth mindset, design thinking and positive education, which can only be taught through leading by example. We must be effective leaders in necessitating the significant change required to transform pedagogy and to maximise the countless benefits offered by modern learning environments and digital technology. The key questions educators are asking themselves are: How do we introduce innovation in the curriculum through integrated learning systems? How do we find time and space within the curriculum to promote innovation? How do we engage students and ensure inclusive technology and innovation strategies that excite female students, male students and students of different abilities? How do we introduce future technologies like AI and IoT to students? How do we get entire school communities to rally behind a new way of learning? Well, we’re positive we have the answers. While some institutions are still navigating unchartered territory to find a way to include innovation in the curriculum, a select few in Dubai are paving the way for others and working towards future-proofing their children. These leaders are innovative, ready to challenge old notions and transform teaching as well as learning. They aim to equip their students with the knowledge, skills and qualifications required for their future. In doing so, they are also maximising learning opportunities offered by digital technology and flexible learning spaces. Dubai British School and JESS Arabian Ranches are two such examples of institutions creating 'tomorrow's classroom”, by championing the development of 21st-century skills among their young learners with the support of Kalebr, an education company whose products promote 21st-century skills, happiness, well-being, sustainability, making, coding and innovation for students of all ages. By having introduced STEAMathalonX to their learning programs, these schools are tapping into the equitable access of several high-quality scalable and engaging learning tools, support, resources and environments for teachers and students. What is STEAMathalonX, you ask? It is made up of exciting, play-based competitive innovation league which are raising the bar for positive education, happiness, wellbeing, social impact and twenty-first-century skills. Whether it is an intra-school event, known as STEAMathalonX, or a competition between different institutions, known as STEAMathalon, learners are engaged in big transferable ideas that transcend time, places and situation. Every STEAMathalon focuses on STEAM (Science, Technology, Engineering, Art, Math), positive education, making, coding, UN Sustainable Development goals and citizenship within the core curriculum. STEAMathalonX arm innovators of all needs and abilities with powerful tools and projects to control physical objects and solve real problems, empowering and engaging learners with 21st-century workplace skills that save time and create healthy learning communities. The grassroots premise of STEAMathalonX is that learners discover, innovate, market and celebrate together, working in teams and as high-performing individuals who belong to workspaces of the future. The challenge kicks off after they are organized into teams and provided with a brief of a real-life challenge to solve. Learners use Kalebr's innovation and well-being framework to come up with exciting ideas that contribute towards creating a 'future-proof' portfolio. Guided by the teacher, learners launch into their projects independently, learning through discovery as they embark upon their journey. They make their designs and their futures with rapid prototyping. Learners think, and learners do. They launch the coding tool to control and optimise their world-changing inventions. During this process, they quickly gravitate towards professional coding languages. They promote their inventions to the subject-matter experts and the larger community to establish themselves as thought leaders and change makers.. Teams are scored on creativity, innovation, sustainability, positivity, and the project as a whole. As was the case with Year Five at JESS Arabian Ranches and Year Seven at Dubai British School, who recently competed in STEAMathalonX, students were required to create a satellite. The judging criteria included how well their design was able to move its solar panels, the quality of their LED lights and the functionality of the heat and light sensors. When their inventions were complete, they deployed entrepreneurial skills to engage wider communities via popular social networks to promote their ideas, inventions and own personal brand. The overarching outcome of STEAMathalonX is that learners exhibit their aptitude for 21st-century skills while showcasing and celebrating their mastery of real-world skills of the future: a win-win situations for everyone involved. One of the fundamental goals and benefits of STEAMathalonX is that students get a chance to be more responsible for themselves as learners in a group setting. Educators and parents who engage with the youth in this way come to understand them better, gaining insight into their aspirations and the communities to which they belong. This makes it easier for them to meet the next generations’ needs and ensure that the learning process is both relevant and challenging. Specifically, when students are happily engaged in their learning, educators are able to make the fullest use of their professional skills as educators and find ways to make learning more fun, engaging and relevant. Not only this, but the collaborative learning process instils a greater sense of confidence in students and helps address factors such as anxiety and boredom in the classroom. This, in turn, promotes better mental health outcomes as a result of the positive cognitive connections made and an increased sense of autonomy, engagement and achievement. Neal Oates, Head of Innovation at Dubai British School said that through STEAMathalonX, his students were presented with exciting opportunities to work together and support each other, and by doing this, they learned to cooperate with each other and collaborate on the project. “The brilliant thing about Kalebr and STEAMathalonX is it is not merely about coding or technology, but it is an inspiring combination of creativity and leadership as well, which allows it to be extremely inclusive for the learners. As was observed during the STEAMathalonX, the students are utterly engaged, you see them looking at technology in a different way. “As His Highness Sheikh Mohammed bin Rashid Al Maktoum has stated, children are the capital of the future, and the reality is that jobs are completely changing with the automatization of processes, which may see entire industries disappear or completely revolutionise. It is important for children to be familiar with new and innovative concepts and technologies in order to prepare them for prospective future careers,” Oates said. 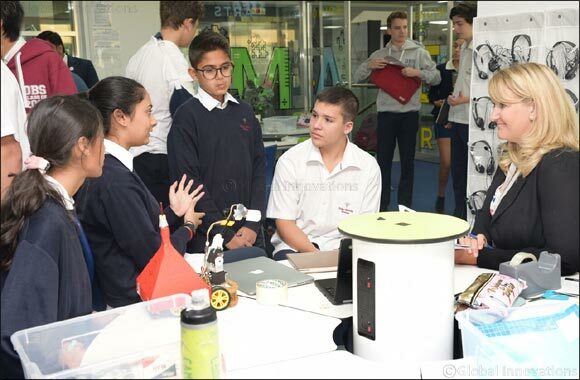 Noel Tuohy, Head of Year 5 at JESS Arabian Ranches also said the inquiry-based approach encouraged by STEAMathalonX helped students to be creative, engage in research, think critically about the material they use, collaborate and reflect on outcomes. 'STEAMathalonX is the best way to completely integrate different areas of learning for students. It is critical for the long term development and success of learners to ensure what is learnt in the curriculum is real, relevant and integrated into all aspects of their lives. And STEAMathalon achieves this. Not only that, but the enhanced, two-way learning partnership with educators promoted by STEAMathalonX inspired students to make independent discoveries through self-inquiry within the setting of a supportive learning environment,' Tuohy said. Strategic outcomes of STEAMathalonX are reinforced in the theory of the 2004 research paper 'The Seven Principles of Sustainable Leadership', whereby author Andy Hargreaves wrote 'where their voice is sought and heard, students are more likely to have enhanced learning partnerships with educators, be more motivated to learn, think more deeply, and understand and develop their skills as learners'. By sharing power and the responsibility for learning, educators set their students on a path to fulfilling the vision we at Kalebr have for them, and honing their abilities ‘to secure a sustainable social, cultural, economic and environmental future for our country’. Never before has it been more important to highlight the importance of developing new understandings about learning, rethinking the role of both the educator and learner, and connecting learning more closely with the world beyond school, with all its unknown challenges. In future proofing our next generation, success will be witnessed in learning institutions who are proactive in working with the whole school community to develop a strong, future-focused vision for their school, ensure there is an emphasis on learner outcomes and remain well-informed so that their decisions are built on the best practices for 21st-century learners. It's also crucial to have a growth mindset, be supportive of experimentation, quickly address strategies if they're not working and develop a school culture that supports constant growth. Additionally, it's necessary to maintain coherence across all domains of the school by aligning everything to the vision. Schools need to manage change effectively and take their staff along for the journey through through timely professional development and good communication. Klaus Schwab, Founder and Executive Chairman of the World Economic Forum, recently made a statement that extends to businesses, too: 'It is critical that businesses take an active role in supporting their existing workforces through reskilling and upskilling, that individuals take a proactive approach to their own lifelong learning, and that governments create an enabling environment to facilitate this workforce transformation. This is the key challenge of our time'. Echoing Schwab's sentiment and reinforcing the UAE's commitment to nurturing a knowledge-based economy, a recent public tweet made from His Highness Sheikh Hamdan bin Mohammed bin Rashid Al Maktoum's official Twitter account during Dubai Executive Council, read: 'the next phase requires a strong focus on advanced technical skills to prepare the next generation for the future. Technical and Vocational Education and Training is critical to our ability to excel in the future and enhance our economic and social sustainability. Our mission is to prepare the next generation to compete both regionally and internationally'. It is widely agreed that the world is facing increasingly complex challenges today, as well as staring down the barrel of a technology revolution which will only continue to evolve. This requires disciplines to converge, necessitating a different set of skills and competencies. Because of this, industries are rethinking how they hire and develop talent at all levels. Companies need employees who are innovative thinkers, excellent problem solvers and practice well-being to remain resilient in the face of rapid changes, growing advancement and a plethora of challenges.